‘Indrani told ex-husband if Sheena dies, we share Peter’s fortune: Police’ (Indian Express, Mumbai, 29 August 2015). For those who may have been hiding under a rock for the last few days, the alleged murder of Sheena Bora by her media tycoon mother Indrani Mukherjea has rocked the nation. Indrani has been arrested by the Mumbai police. The refusal of Indrani to identify Sheena as her daughter over the years and the neglect have been written about extensively. 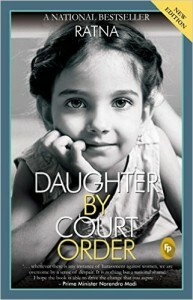 My novel, Daughter By Court Order was published last summer and raised several eye brows and, as The New York Times feature article on the book suggested, had the Capital abuzz. (Families feud over Delhi Estates, The New York Times, 9 September 2014). The reaction of many who don’t want to acknowledge the truth over the past year has been one of shock and disbelief. For in my novel, the mother Kamini brutalises her daughter Aranya over years, starting from birth. Kamini favours the son and her malice towards her daughter has no boundaries. Determined to write her off, she does exactly that. Forgetting ostensibly to show her on a family tree thus wiping out her daughter’s very identity and obliterating her existence with cunning. And all this because Aranya was an irritating, inconvenient reminder of Kamini’s age and an obstacle to her overarching ambition and avarice. In the book, Kamini has the support of her son, daughter-in law and her well-known brother. Everyone over an extended period of time just shrugs off the injustice and they get on with their lives. No one asks about the missing daughter. Greed and the desire to appropriate inheritance adds to what is already a subjugation and wiping out of the identity of the inconvenient daughter. And indeed the Indrani Mukherjea saga is a sordid affair. The twists and turns are beyond the realm of imagination. If last week or even a month ago, anyone had dared cast aspersions they would have been chastised for the Mukherjeas were an honourable, izzatdar family. Icons for the newly emerging India. Indrani had successfully broken the glass ceiling and was in the past hailed as a media queen. Ellen Barry referred to the home I describe in my novel, as “a petri dish of greed and ambition.” The sad truth is that the Mukherjea home seems to have had an equal measure of all that is sordid and evil in my book. The partiality and love for one child at the cost of hurting and maybe even murdering another is now being widely discussed on national TV. So what makes Indrani Mukherjea and Kamini Dhari soul sisters? An unparalleled love for themselves? Ruthlessness? Bottomless greed? Ambition? The belief that they can override the law? That their voice will drown the facts? Their powerful friends and money will erase any sign of wrong doing? And maybe the human weakness to remain forever young? And having no use for their ‘inconvenient daughter,’ they deal with her as they deem fit. These are almost sociopathic; the boundaries of right and wrong get blurred when driven by the above motivations. They come first … always! And their word is the last. Mean mothers have existed in real life and in fiction … sometimes, we in India don’t acknowledge that the public face of prominent women might hide the terrible secrets and wrongs they inflict on their daughters. ‘Fiction is obliged to stick to possibilities. Truth isn’t,’ said Mark Twain. How appropriate. And relevant too. When a senior journalist known for her strong views on women’s rights condemned Indrani on a news show on NDTV and said, “The truth always comes out,” I could not help but smile. Such people exist amongst us. They are not from some other place or from some segment of society we do not associate with. We must share such stories and stand up to help fight these painful situations. Do write in to the DBCO Forum for Women if you would like to share your story.